I don't recommend anything I've not tried and this product is from Aldi, now just because it's from a budget supermarket it doesn't mean it's a cheap nor inferior product. 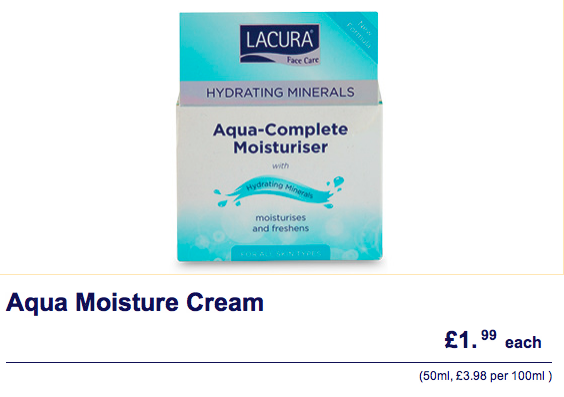 Over the years both as a consumer and as a beauty therapy lecturer I have used both professional and top end market products, but I have to say I am now using this moisturiser and I love it. Most moisturisers for my age group are very oily and still having oily skin I want a product that will deeply moisturise my skin without leaving me like an oil slick, this product from Aldi suits me perfectly. Don't dismiss other great buys from this store either, it does sell some other great products too.